Hi my name is Candace Alstad – Davies, I have earned multiple certifications as a resume writer and interview career coach. I specialize in resume writing, LinkedIn profiles, interview and career coaching. Turning your dream job into a reality is what makes me passionate and motivated to provide premium resume writing that lands you the best job in the shortest amount of time. After 16+ years of helping job seekers around the globe secure the jobs they desire, I still enjoy writing resumes and love hearing my clients’ success stories. Without a premium resume, you could easily encounter a challenging and long job search. A job search is substantially easier with an accomplishment-based, keyword-rich resume and cover letter. You need to portray yourself as the Number One candidate. Show the employer how you are the absolute best choice for the position. Your resume needs to make it to the list of job candidates to call for an interview. LinkedIn profiles are also critical to many job seekers. 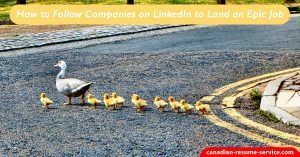 LinkedIn is an excellent way to network, market yourself, and catch the attention of potential employers. Therefore, it is crucial you develop a hard-hitting, experience-focused profile. Don’t leave your career success to chance – design a searchable, unique LinkedIn profile to help advance and expedite your job search. If you plan on creating a DIY (Do-It-Yourself) resume and cover letter, we have an abundance of free information on the website to tackle this vital task. If DIY resume writing is not for you, we can help you every step of the way. We determine which format is best for you, determine which areas to highlight, and how to uncover and communicate relevant achievements and transferable skills to optimize results. Resume writing is one of those critical tasks that just shouldn’t be left to chance! Consider hiring me, a professional resume writer and interview career coach, to help you stand above the crowd and get one step closer to landing the best career opportunity – the job of your dreams! As mentioned above, I have earned multiple certifications in resume writing and career coaching. Why should you hire a professional resume writer with career management expertise that believes in lifelong learning? Simple – it will get you the results you need. Over the last 16 years, I have worked with clients worldwide in various positions and industries. Some sectors include oil and gas, IT (information technology), finance, nonprofit, law enforcement, banking, engineering, healthcare, hotel management, human resources, construction, education, hospitality and numerous other professional areas. Job titles and levels have been career changers, consultants, sale managers, trades people, nurses, construction supervisors, accountants, marketing executives, consultants, C-Suite level executives (CEO, COO, CFO, CIO), and department managers. The list of professional occupations I have written resumes in is extensive. If you are planning on making a dramatic career transition, I can definitely help. Even though I live in Grande Prairie, Alberta, Canada, I have and developed resumes for fellow Albertans, as well as clients in Ontario, Saskatoon, Quebec, British Columbia, and the rest of our great nation. Many of my clients come from the United States of America (U.S.). I have also provided job search services to customers across the globe, including 6 out of 7 continents, particularly in the UK, Australia, South Korea, and the Middle East. Working with my clients via phone and email has been my business model for 16 years, and the resume writing process from start to finish is convenient and works flawlessly. 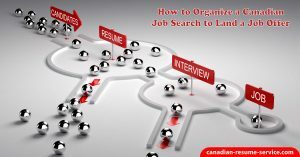 My extensive training and certifications have helped me develop the skills and knowledge base necessary for identifying job search strategies for your unique career path, as well as the talent to deliver solid job interview and career coaching. My accreditations hold me accountable and demonstrate my commitment to producing quality products that will get you positive results to secure the best position for you. My goal is to help you land your dream job, and thrive in your career of choice! 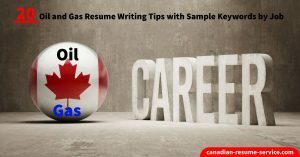 Why Delegate the Writing of Your Resume to a Professional Resume Writer? For instance, if I didn’t delegate the completion of my personal and business accounting, general ledger, and the filing of my personal and corporate income taxes, it would overwhelm me. So I am thankful that for the last 16+ years, my life has been easier, less stressful, and I have had the peace of mind that my taxes are accurate. I have absolutely no regrets about deciding to delegate this important project to a chartered accountant. In fact, I’m incredibly grateful that this accounting team can help me in this professional way. The same can be said about writing your resume. This is an important task that needs to be done in a specific way. Don’t feel bad about delegating the writing of your resume to someone else. Job seekers contact me daily to make sure they get their career moving in the right direction. It’s never a bad idea to enlist the expertise of professionals. We would enjoy partnering with you on this important resume writing project. For 16 years, our resumes have gotten results, even in a tight job market. Whether you are entry-level, management, senior executive level, or a career changer you can benefit from professionally-written job search documents. Don’t underestimate the importance of a premium resume and cover letter. Your job search documents are the only thing representing you in your absence. Make sure they stand out and demonstrate the benefit of hiring you. By carefully wording your resume, cover letter, and LinkedIn profile and highlighting your skills, you can successfully convey what you can bring to an organization. Let us uncover and communicate your relevant core competencies, accomplishments, and unique talents that will make your resume truly stand out. Your documents will showcase your assets clearly and concisely with “punchy” phrases that grab the reader’s attention to entice them to call for a job interview. We don’t use cookie-cutter, generic resumes or bland resume templates – every resume and cover letter is unique and tailored to the individual. From the content to the format to the overall design and physical appeal, your resume will represent you. Our documents are keyword optimized to get past the applicant tracking system (ATS) and into human hands. We know which industry buzzwords to use, and how to implement them within your resume and cover letter correctly. My expertise in SEO (search engine optimization) is extensive – your resume needs to be discovered by the right people. Dedicated with a vast knowledge through in-depth recruitment expertise, industry research, and resume writing certified courses and associations. We provide LinkedIn profile development and strategic professional networking usage, interview preparation consulting, and career coaching, in addition to writing business statements, recruiting letters, networking letters, and every other type of document you may need to conduct a successful job search! Confidential service – you privacy is vital. This is my number one commitment to you! We will never sell or share your private information, with anyone for any reason, whatsoever. You need a resume writer with excellent insight on industry “lingo,” modern keywords, what employers are seeking, and how to demonstrate this within a resume and cover letter. You need someone that stays current on job market trends, and can successfully isolate your most marketable skills and abilities with the end result being your appointment calendar filled with interviews. Do You Need a Professional Resume Writer? Have you been procrastinating on making a career transition? Are you too busy to take the time to put together an attention-grabbing resume properly? Do your resume and cover letter contain industry and job title keywords to get past the applicant tracking software? When reading your resume, does it concisely show the responsibilities you executed for past employers? Does it clearly convey the accomplishments you achieved in former positions? Does your resume make you stand out from the pool of candidates? 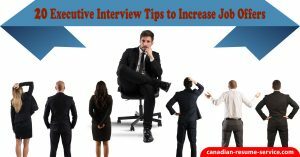 Have you been getting the interviews you deserve? Does your resume, cover letter, or LinkedIn profile depict your real VALUE to an organization? I know what recruiters and hiring authorities are looking for in a candidate and can effectively communicate that in a resume, cover letter, and LinkedIn profile. You will have a resume writer and career coach that upholds the highest professional standards and is your advocate – your success is my success! I have an unwavering commitment to get you in the interview door to land the position you desire. Start moving your career forward today! Save time, stress, and frustration by contacting us. 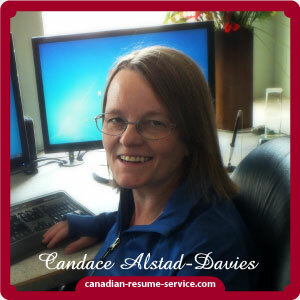 You will be relieved when you order the service or contact Candace Alstad- Davies, the President of Canadian Resume Writing Service, at candoco@telus.net or toll-free 1 877-738-8052 or Local/International 780 513-0010. I offer a VERY personalized, cost-effective, and results-driven service. Learn about the resume writing packages we offer, and the investment needed to get your career moving.